There are more than 50 breweries in San Diego County, with new ones opening every day, it seems. The industry is growing so quickly that some are calling the city the “Beer Capital of California.” (Okay, maybe that was just me–but it’ll catch on!) If you want to explore the diverse offerings but have limited time, it’s best to either do a guided tour to check out some breweries, or just pick a region and plan a route around that area. 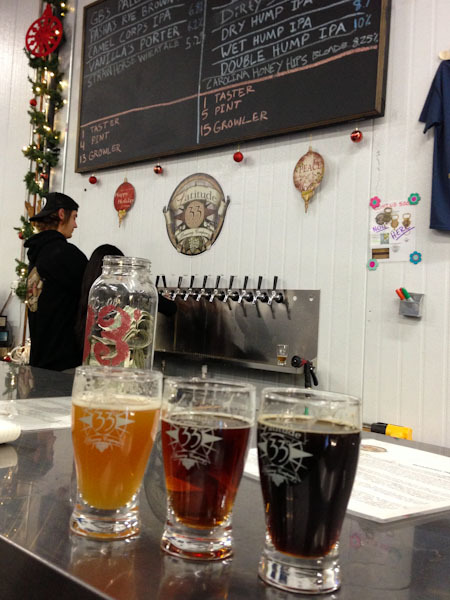 We opted for the latter, and decided to check out breweries in the North County area. We planned to meet up with our friend, Deb, from Traveling Well For Less who lives nearby, and she suggested a few additional breweries that, added together, made for a perfect afternoon of craft beer exploration. Deb also offered to drive so that we could feel free to sample all we wanted… what a great friend! (Deb–we’ll return the favor when you come to NorCal!). So we devised this North County San Diego Brewery Tour: 4 great local breweries, 8 miles from start to finish! Stone Brewing Company is known for their strong IPAs (Kevin’s favorite), so we planned our day around stopping here. Also, they were one of the only breweries I researched that offered formal tours of their commercial brewing facilities, and this was something I was interested in learning more about. I told some locals that we met the night before about our brewery travel plans, and they gave us an important tip. 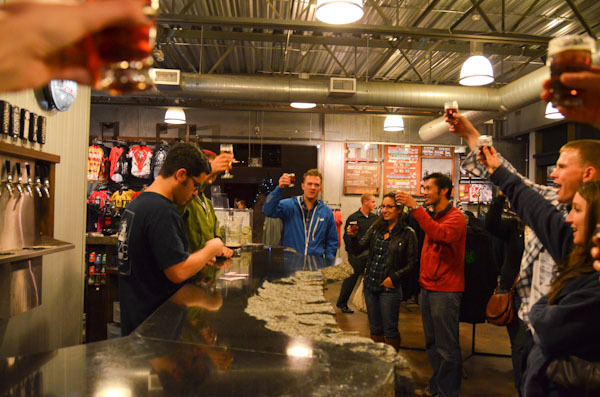 If you want to do Stone’s popular brewery tour on a weekend, get there as early as possible. It sells out quickly. We arrived Saturday morning, just before noon, and the tours had already sold out for the next few hours. Next tour was at 3. We knew that wouldn’t give us enough time to check out other breweries on our list, so we opted to sign up for the 6 pm brewery tour. Tickets cost $3 per person, but that includes four tasting pours, you get to keep the tasting glass, and a portion is donated to charity. After buying our tickets, we explored the sprawling property. 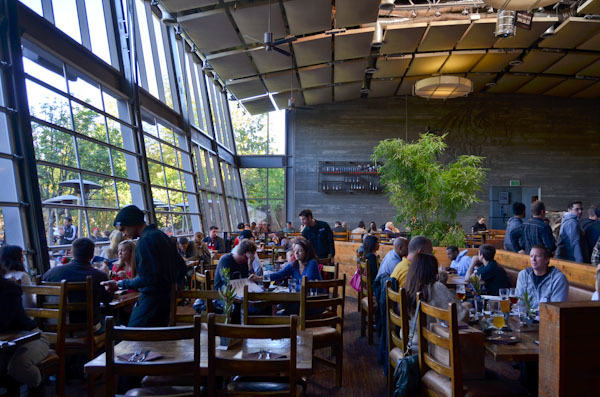 The brewery has a large restaurant onsite, large indoor bar, an outdoor bar, and several outdoor seating areas scattered around a small network of trails. 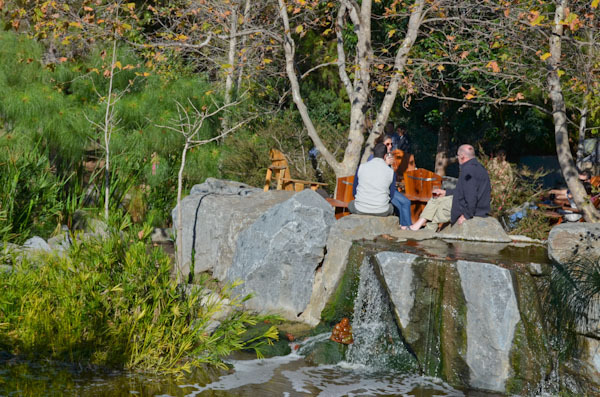 It’s a great place to hang out and catch up with friends, judging from how busy it was before noon on a chilly, winter day. While waiting for Deb to arrive, we sat at the bar and ordered from their long selection of beers. Kevin tried their newly released annual beer, Vertical Epic 12-12-12. Knowing I’d get to try several of their IPAs and strong ales later at our tour, I opted to try one of the other California craft breweries they had on tap. I had a nice, citrusy saison (Saison du Prick–Fifty Fifty Brewing Company, in Truckee, CA). We ate just before arriving so we didn’t get to try their restaurant, but the menu looked excellent and it got rave reviews from a non-beer loving friend! This brewery was in a somewhat hidden, light-industrial park. The location was formerly occupied by Stone before they outgrew the space and moved to their current location. Lost Abbey is known for their Belgian-style beers, and Port Brewing Company actually started as a home brewing operation run out of a pizza place! 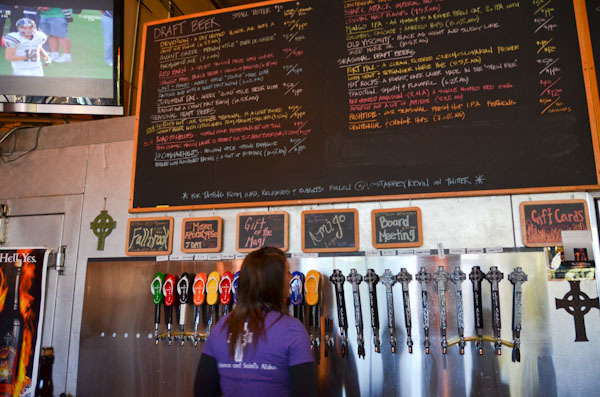 The two breweries (operated by the same owner) share a tasting room, allowing us to sample a huge selection of beers. Even better, tasting pours for most beers were only $1. We could have stayed here all day! Some of those we tried included Port’s Red Headed Assassin and Lost Abbey’s Red Barn Ale, 10 Commandments, and Gift of the Magi. I really wanted to try one of Lost Abbey’s limited quantity sour beers, but they were only available in bomber-size (22 oz) bottles to drink on site–and we knew that wasn’t an option if we wanted to make it to two more breweries! 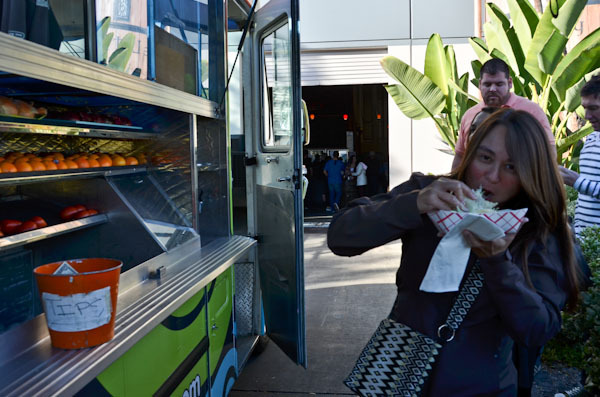 The tasting room here had a food truck conveniently parked outside, so we were able to grab lunch before moving on to the next stop. This place was really new, open less than a year, and the smallest of the breweries we visited. Like Lost Abbey (as mentioned above), Latitude 33 took over use of their current space from Green Flash Brewing Company when they outgrew the facility. Tasting pours here were only $1. I found the most interesting beer of the day here: Slaters 50/50 Smoked Red Ale. It was very smoky and somewhat peppery. I wavered at first about whether I liked it at all, but by the end of the pour decided I really enjoyed it. Kevin tried their Double Hump (Double IPA) and found it really smooth. The final stop of our day was the Iron Fist Brewery. They had a very diverse selection of beers, including an oatmeal stout (Velvet Glove) served on a nitrogen tap which gave it a creamy texture that I love. I found a saison (Hired Hand) that I really enjoyed. I was surprised to notice that almost every person in the bar had brought their dog. It took me a few minutes to realize this was no coincidence–a local animal rescue was doing a fundraiser on site! 5-ish…We returned to stop #1, Stone Brewing Company, for our 6 pm brewery tour. 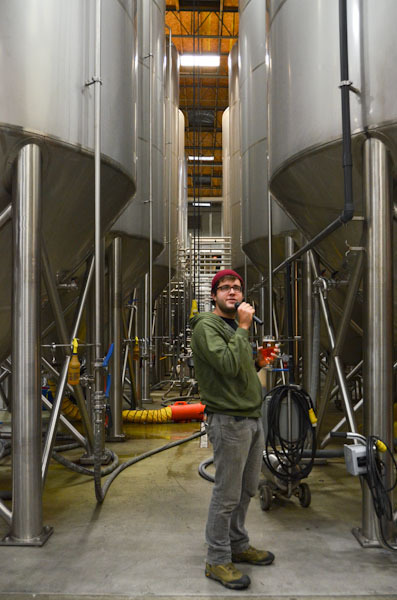 Our guide, Justin, told us about the different ingredients they used and the brewing process. Then we went into the fermentor room to see the huge tanks that they use to ferment their beers. Bottling happens right in the same room off to the side. It all seemed a little cramped, considering this is the sole production facility for the company, though we were told they were planning to build a new bottling and shipping facility next door. At the end of our tour, we got to sample four of Stone’s lineup. Three of the four were common beers we were already familiar with, but it is always nice to taste beers side by side to understand how they compare. The fourth was their smoked porter which was good, though not as unique as the smoked ale I’d tried earlier at Latitude 33. 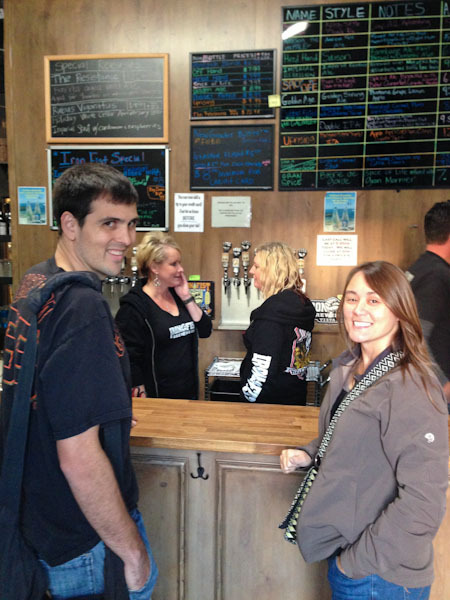 It was a great day of beer tasting, and a great itinerary for any beer lover when visiting San Diego! Do you have a favorite San Diego craft brewery? Are those one-dollar bills in the last pictures? I definitely didn’t know San Diego was a big area for breweries. I’ll have to check it out when I’m out there this summer! Where are you going to be? You coming north? Come visit! I’ll definitely take you up on your offer of a No Cal brewery tour. Stone Brewing is simply an amazing place isn’t it? I don’t know much about Latitude 33, but Lost Coast is also stellar…ahh, makes me want to return to San Diego. Wish we could get some of these beers here in Toronto. West Coast US < --> East Coast Canada beer swap?